The Prince Edward Legion Golf Club has been in existence for over 40 years. A friendly group of approximately 60 men and women. The Prince Edward Legion Golf Club play at the Bush Golf Course. Bush Golf Course is a nine hole public course just outside Beausejour, Manitoba the clubhouse includes a licensed restaurant. Five game dates are scheduled, once a month from May to September. The golfer pays for each game played. League plays Thursday night from 7:30 to 9:30 pm. First, from Second week in September to mid December. Second, from second week in January to mid April. There is a wind up at the end of each session. 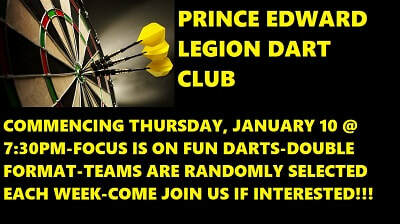 We are focused on FUN darts. We play a DOUBLES format. Teams randomly selected each week. If you have never played before, come on down and we will teach you, If you are experienced, GREAT.